Produced by Wong Jing and co-directed by Vincent Kok and Stephen Chow, Forbidden City Cop (1996) is yet another delightful comedy from Hong Kong cinema’s undisputed King of Comedy; the film combines two of my personal faves — Stephen Chow and James Bond — with great results. Think of it as a 007 movie transplanted to the far-flung past of ancient China. 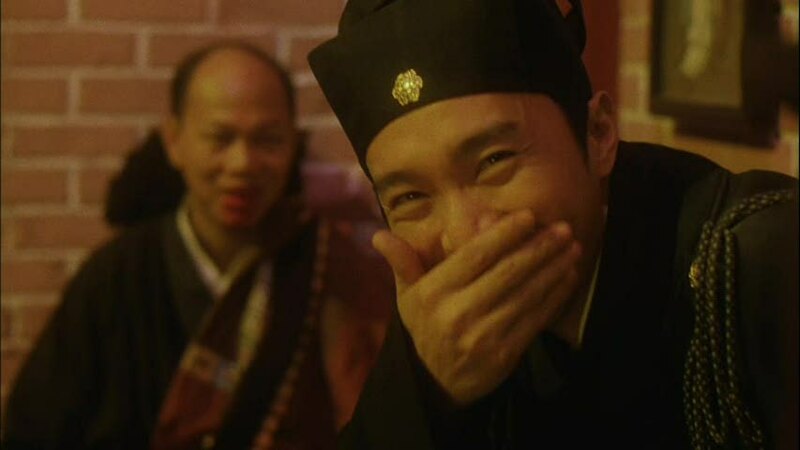 As Stephen Chow films go, it’s also a nice companion piece to his equally amusing Bond send-up from two years earlier, From Beijing With Love. The film gets off to a great start with hilarious Bondian pre-title sequence featuring Stephen Chow’s Ling Ling Fat (aka: 008) interrupting a famous duel between Yip Koo-Sing and Sai Mun Chiu Suet, as Luk Siu-Fung looks on. If you’re unfamiliar with that particular trio of wuxia heroes, watch the subsequently-filmed The Duel (2000) with Andy Lau, Ekin Cheng, and Nick Cheung in the above-listed roles for reference. Even if you don’t get the references, it’s still pretty amusing.